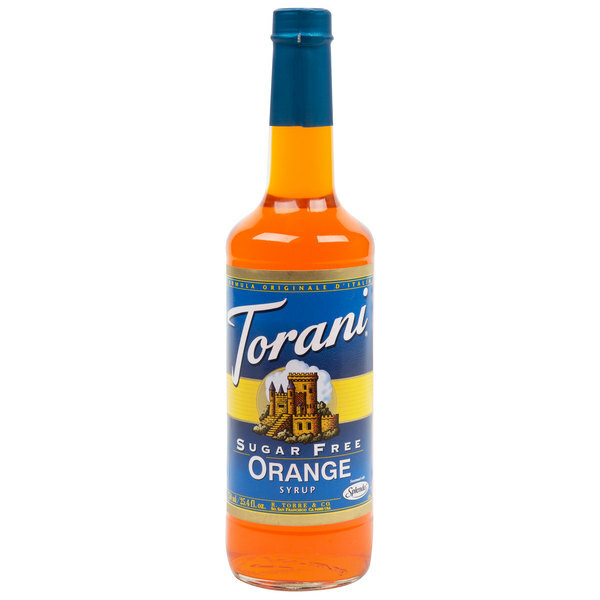 Bring all new flavors to your specialty drink menu with this Torani sugar free orange flavoring syrup! It's sweetened with Splenda brand sweetener, which offers the taste of real sugar without the calories. This tempting flavor will complement your beverages without overpowering them or being too sweet, while the user-friendly bottle will be convenient for your busy baristas to use. Torani flavoring syrups are specially formulated to resist curdling in milk and to hold up well under heat, making them the perfect choice for espresso-based drinks, brewed coffee or tea, and more. Use this flavor for frappes, iced coffees, smoothies, and even baking! One splash of flavoring syrup goes a long way, and this sugar free syrup perfectly blends the sweet, tangy, citrus flavors of fresh-picked Florida oranges. Discover new Torani recipes for this flavoring syrup, including a hocus pocus cocktail, light orange lemonade, low calorie orange cream soda, and sugar free citrus iced tea! Very good sugar free option for your orange flavoring syrup. They taste very similar so it would come down to personal preference. For me it would be the sugar free. We us the orange syrup with our energy teas and drinks its a great way to add a solid orange flavor and bring a little flair. This is a great orange flavoring, I can barely tell that it is sugar free. Great for use in coffees or other drinks, or for flavoring shaved ice. Very strong orange flavor. My daughter's love to make orange dreadlocks frappes. As in EVERY day! I keep telling them that even though this syrup is sugar free it does not count as a fruit! Delicious! Delicious. Check out all the recipes available from Torani on their web site. I am especially fond of the hot tea with orange flavoring included in their collection. Make delicious diet orange soda at home with this great tasting product. Just two tablespoons in a glass of carbonated water and you are set to go! This sugar-free syrup tastes great. My husband likes to make Italian sodas and I like to use them to flavor my water in the winter to help me drink more. A great price and something that I cannot find at any of my local grocery stores. I love the orange flavor and it is sugar free. I was so surprised when I first tasted it. The smell is great and the syrup is excellent in my green tea. Love the orange flavor. This goes very well in our shakes and mixes well when we blend them together. I love the design of the bottle and I love the color of the syrup. This works great for making italian and italian cream sodas! It has a similar taste when combined with soda water to many of the orange sodas on the market, but with the added convenience of being able to customize your drink! Combining this syrup with soda water or sparkling water plus dairy creamer (or almond creamer) and some whipped cream for the top makes a really fancy orange cream soda! This website is amazing to order from. Strawberry and lemon are my favorites but this orange flavor is nice for a creamcicle flavor with vanilla protein! My family and I Love this syrup! It's one of our most popular ones. Such a great true taste that sweetens any type of drink. Whether hot or cold! 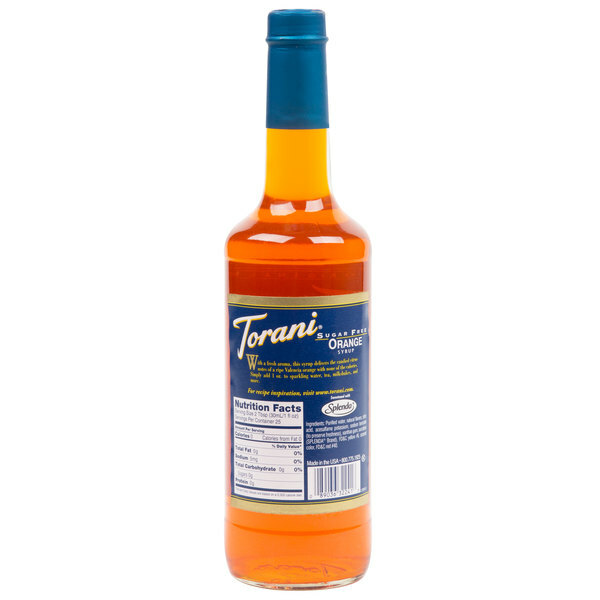 We love this orange Torani sugar free syrup. We use it with cream soda to make dreamsicle sodas, and we also make orange - vanilla shakes for my dad who has diabetes. Orange flavoring is one of our most popular flavors in anything we have in our store. Finally getting it in sugar free makes it twice as good. I'm not usually a sugar free fan, but most of the torani sugar frees are excellent and have great flavors. Absolutely fantastic! Tastes like orange soda, and can be used to kick up the flavor of the typical Orange Julius recipe without adding extra sugar. It also works well in sauces. I've already reordered this! Use this on shaved ice or in water. Its awesome. Tastes great and sugar free which is important to diabetics. I recommend this product to all!! I like be this product and the fact that it is sugar free is a bonus. The bottle lasts along time and the flavor is great. These coffee syrups are great! I ordered a variety to use in protein shakes. AWSOME PRICE ! Cheapest around! Will never order syrups from anywhere else ! Put in a vanilla protein shake and it makes an awesome creamsicle shake ! We use a lot of syrups we have a smoothie shop. These are by far the best priced anywhere. They come very well packed and add great flavor to our drinks. Thank you WEBstaurant. You're the greatest!!! !